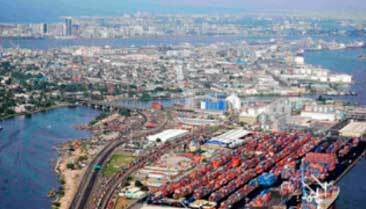 Lagos features two ports – APAPA and TIN CAN ISLAND. 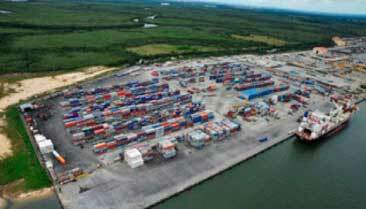 The Apapa container terminal is located at berths 15-18, under concession to APM Terminals. The Apapa break bulk and mega bulk terminals are located berths 6-14 under concession to ENL Consortium, as well as berths 19-20 under concession to Greenview Development. In Tin Can Island, there are four terminals: berths 1-2 under concession to Josepdam Port Services handling mega bulk and break bulk only, berths 3-5 under concession to TICT handling containers only, berths 6-8 under concession to Port & Cargo Handling Services handling both containers and break bulk, and berths 9-10 under concession to Five Star Logistics handling container, break bulk and RORO. 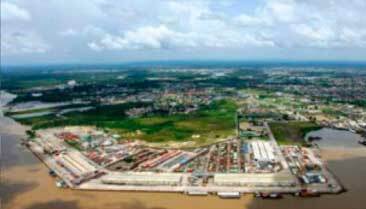 Situated in Rivers State in Nigeria, along the Bonny River and features two terminals: FOT (Federal Ocean Terminal), and FLT (Federal Lighter Terminal). The port handles break bulk at FOT berths 1-2 under concession to Intel Services, and containers at FOT berths 3-4 under concession to WACT. Equally, break bulk is handled at FLT berths 1-4 under concession to Intel Services, and at berths 5-6 under concession to Brawal Shipping. 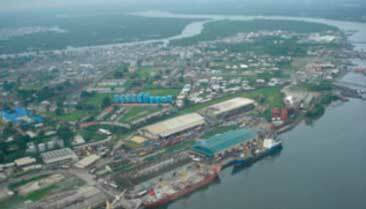 Attached to the port area, is the Onne Oil & Gas Free Zone. Also situated Rivers State along the Bonny River, features two terminals: berths 1-4 under concession to PTO, handling container and break bulk, and berths 5-8 under concession to BUA handling mega bulk and break bulk. Situated along the Forcados/Warri River, features two terminals: Old Port under concession to Julius Berger, and New Port handling container and break bulk under concession to Intel Services. Situated 50 miles up the Calabar River, features two terminals: Berth 1 handling break bulk under concession to Intel Services, and berths 2-8 handling container and break bulk under concession to Ecomarine.